One of the beauties of the watch industry is that there is truly something for everyone. There are thousands of companies out there with incredible amounts of funding building watches in every niche. Some are more luxurious, some are more decorated and some are very minimal. They come in all sorts of sizes, shapes and you guessed it – colors. Even white watches! No matter what price range, style, function, or color scheme you’re after, you can find a piece that will satisfy you. Most watches come with the standard gold and silver designs, right? 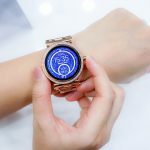 The trend for black watches have definitely taken off, but one look that you might not have seen too much of before is probably the all-white watches look. Interested? If this is the case, you’re in luck! 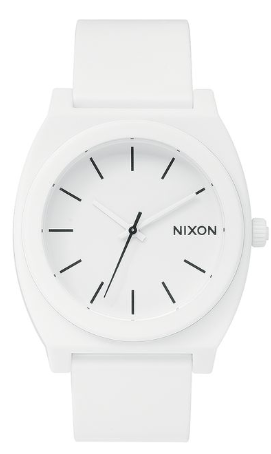 We have put together our 8 favorite white watches below. Armani is a massive name in the fashion industry and has a reputation that is unmatched. 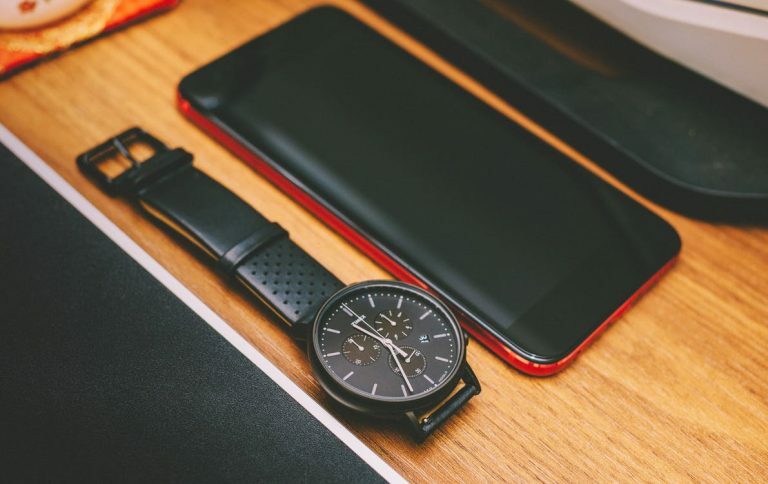 Though they are better known for their clothing and footwear, they have quietly been making a name for themselves in the watch market too. This model has a delightful, clean, all-white design that you’re sure to love, but it backs this up with functionality also. It is a well-made piece that is built to last and even has a chronograph for your timekeeping needs. Some watch shoppers want their pieces to have all the bells and whistles. They like complex movements, windows on the dials, chronographs, and a multitude of other neat features. Other shoppers don’t care much about these and just want a basic watch that looks great and keeps the time. 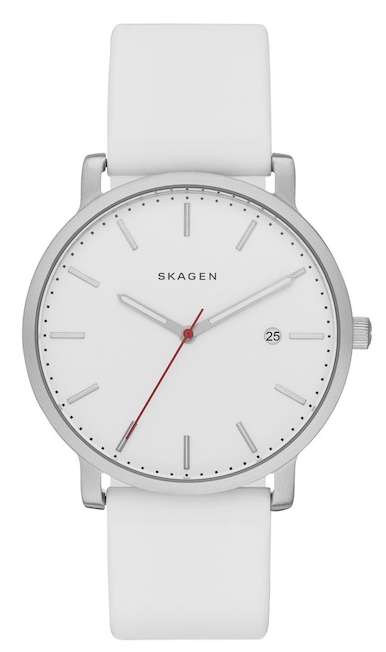 If the latter describes you, consider the Skagen Hagen Sport. It has a simple design that is aesthetically pleasing but doesn’t jump out at you, and a reliable movement that will last for years to come. Like Armani, Diesel is another brand that is better known for their clothing but makes excellent watches too. This particular model is a great piece for people who seek a very modern look. It has a silicone strap and a large case, making it best worn by men and in casual settings. One thing to watch out for is that the dial is designed in an interesting way that might bothersome. The 2, 3, and 4 spots on the dial are written out as numbers, rather than the regular lines you see for the rest of the dial. If you need to keep precise time, then choose a different watch. 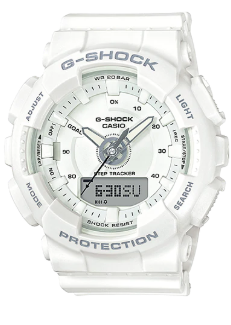 The G-Shock series was born from the goal to make an invincible watch. What went into this quest was waterproofing, shock resistance, and a variety of other features that increase reliability. The G-Shock was the result of these stringent standards, and it has been a favorite for rugged adventures ever since. If you are somebody that likes to get dirty for work or play, this Casio is an excellent choice. Generally, luxury watches do not come in all-white. Instead, they take on the color of the metals they are made out of: Silver, gold, etc. One brand that is in the affordable luxury range that bucks this trend is Tissot, and they do so with the PRC 200 Chronograph. 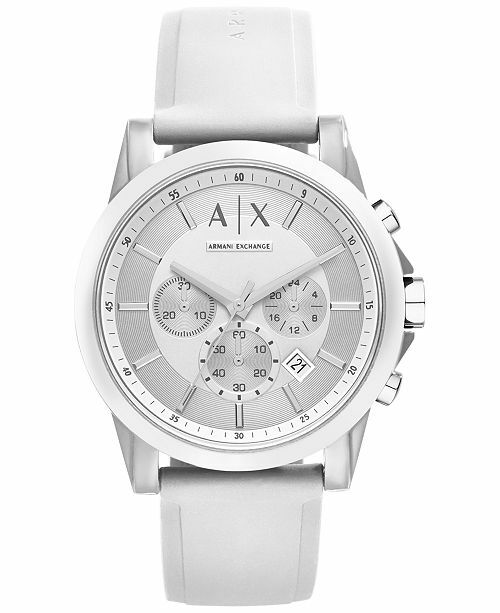 While the case is not white, it is very light silver and fits in perfectly with its white dial and strap. 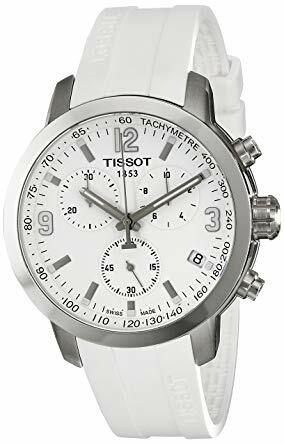 If you’re looking for an all-white style and want to spend a bit more for fantastic quality, then choosing Tissot is a great bet. Most of the watches on this list have had a more masculine style, so it’s time we gave a pick for those with feminine taste. The best we could find is the Fossil Stella. 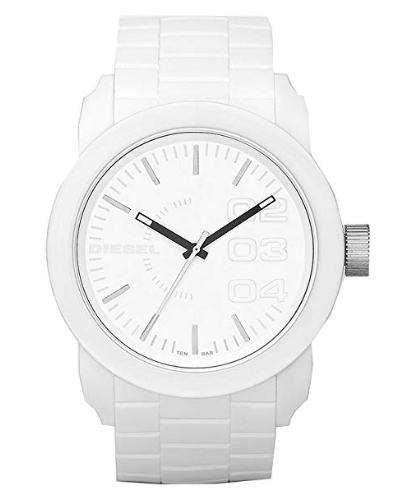 It has a white strap and case made from resin and a white dial, both of which give it a wonderful, minimalist look. This watch definitely won’t be looked at and forgotten, though. It has a bejeweled bezel that will turn heads and upgrade any outfit. 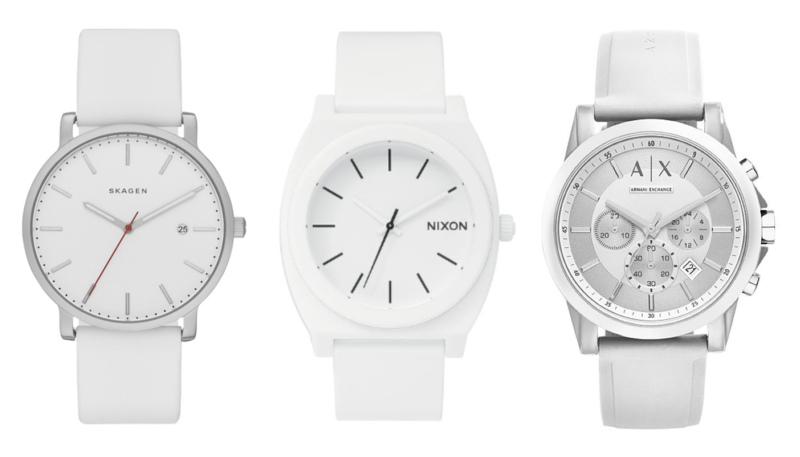 Nixon has established itself as one of the premier affordable watch brands. 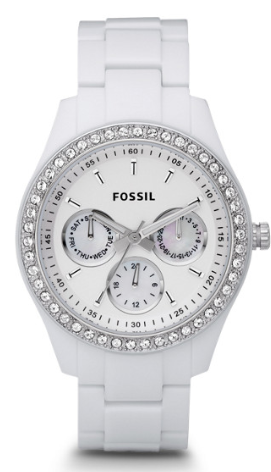 Their most iconic model is the Time Teller, which comes in all-white. This is a great choice for young people that want an attractive piece, but don’t want to break the bank. You know that brand that makes the collared shirts with the alligators on them? Well, their name is Lacoste and they make fantastic watches too. 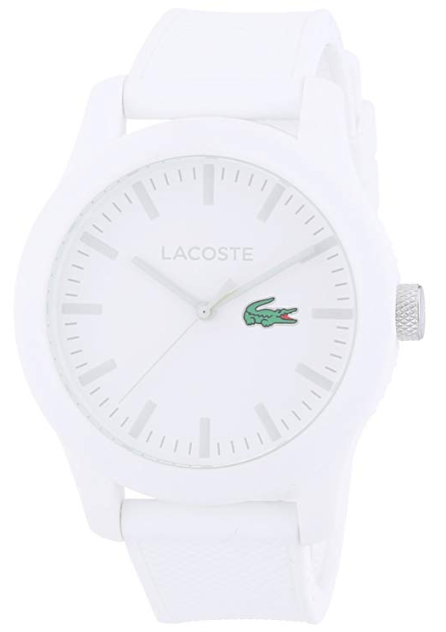 This piece above has that attractive all-white style you’re looking for with their signature green alligator logo acting as an accent on the dial. So when you’re purchasing your next watch, don’t forget you have a ton of options and all white watches should be one of them. You can go with a classic metallic style, or you can take a more novel approach and look for a watch that is all white. You’ll likely fall in love with this minimalist look and be delighted with your purchase. 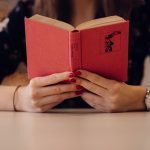 If you decided to go this route, there is no better option than the eight pieces we included on this list.